Here is where the fun begins. After taking the test, you can then explore the ArchetypeMe site through the eyes of your archetype. The site offers articles and information that are divided up by your interests. It has content discovery based on your psychology. So instead of browsing through articles that may or may not interest you, you now have a curated page of content that was designed just FOR your personality type. To make it even more personalized, you also have a pin board, called a 'ME' board, to store articles, images, and information that are of interest to you. 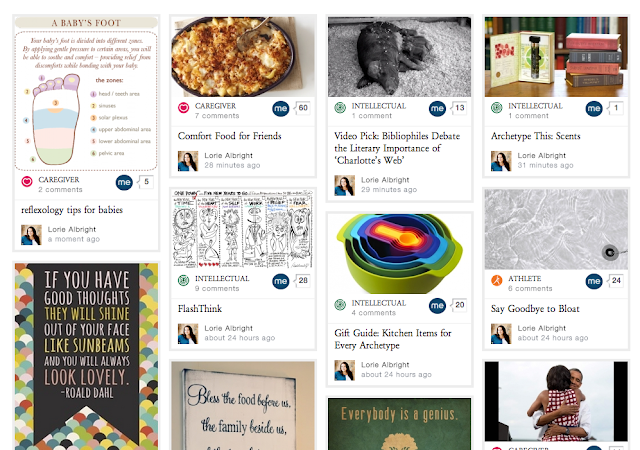 This community feature allows you to explore more content shared by people with similar interests and to share your favorites with friends as well. But you aren't limited to just your own archetype. You will notice that Athlete doesn't show up in my archetype profile (no surprise there) but I can still browse through and look for work out ideas to help meet my post baby weight loss goals and to find an interesting article to discuss with my husband over a lunch date. Besides articles, there are also gift giving guides to help you find the perfect present by archetype. 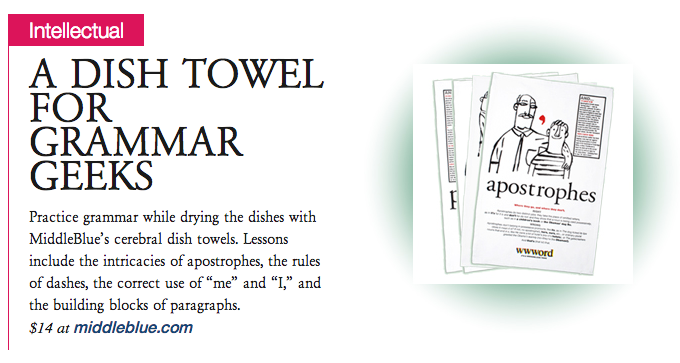 I have a friend who would absolutely love these fun grammar dish towels. One of my goals for this year was to start reading more. Right now any reading I do is either story time for my younger kids or previewing a book before I let my pre-teen kids read it. Through ArchetypeMe, I have found books, reviews, and even a video book club that I never would have found through any of my other frequently read sites. ArchetypeMe makes it effortless to go beyond scratching the surface of my interests. Because it curates the content based on my personality type, it saves me time digging endlessly through other sites' content that I am just not interested in reading. And that extra time will come in handy trying to do things for myself, like reading a good book. Check out ArchetypeMe and see if it helps you know yourself and your world a little better. And if you want to go deeper into understanding your archetype, there is a book Archetypes: Who Are You? that is currently available! Don't forget to take the quiz yourself at www.ArchetypeMe.com! To enter to win a $50 Visa Gift Card, leave me a comment letting me know which archetypes you are (you can find a list of the archetypes on the ArchetypeMe homepage). This sweepstakes runs from 2/13/13-3/15/13. I am a Caregiver (48%), Intellectual & Athlete. I'm a caregiver, intellectual, and creative. The baby food massage chart is so cute. My archetypes are Intellectual, Caregiver, and Spiritual. I am a Creative, Caregiver, Intellectual Archetype. I’m 39% intellectual, 28% caregiver and a 20% visionary! I am 45% creative, 22% intellectual, and 13% caregiver. Neat stuff! Thanks. I'm a caregiver and intellectual. I'm a caregiver, visionary, intellectual. I got to reading and looking around the site so I don't know what my percentages were, they were all pretty close though. I'm Intellectual, Caregiver, and Spiritual. I am 39% caregiver, 28% intellectual, and 13% visionary. I'm 35% Athlete, 27% Caregiver and 18% Fashionista. My Archetype turned out to be Caregiver, Intellectual, Creative. I am 43% caregiver, 19% spiritual, and 18% intellectual. A Caregiver is someone who lives to give and needs to be useful. If you’re an Intellectual, you’re always seeking knowledge and wisdom. Visionary women see important things before others do and make new rules that change the world. Pretty much what I should have expected. I was surprised not to see anything given to creativity! I'm a creative, intellectual, caregiver.